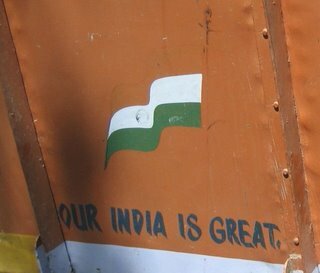 Detail of a truck somewhere in West Bengal. It sure is great! And yes, this is a smidge early by my clock, but it's Indian Independence Day somewhere in the world - like, in India! And while I can't think of a tidy way to tie Indian Independence Day with Bollywood, it just seems really gauche not to wish the country that has produced so much of superwow. Aside to grammar-loving people: from what I gather, it is perfectly acceptable in Indian English to use "wish" like that, with no object. Fun, huh? oh the wish thing. completely confuses me. how do i wish people? do i just go up to them and say: I wish you. or do I need to wish them xyz? I remember in one of the coffee with karan/preity episodes she complained that people said she would not wish them. and she said "but I always wish them" WHAT? Wish WHAT? Oh my head starts to hurt. need to stop thinking about it. please wish me! I'm sure I have no idea. Now that I think about it, it seems that if you are going to wish somebody something, you would go up to them and say "I wish you a very happy one-year anniversary with your FPMBF!" But if you were referring to having wished somebody that, and your listener/reader had an idea of what you were talking about, or there was some kind of context, you could just say "I wished them." Like, one of my Indian friends said "Today is her birthday, right? Wish her for me." So there was no direct object, but there was an indirect object, right, at least by my understanding of how "wish" works? Wacky! Sorry about your head! I know the feeling - it happened to me after our tour manager kept talking about our luggages. Can you feel me wishing you? I certainly didn't mean to imply it was incorrect! But I've never heard it here in the US, nor did I hear it in my two years in Canada. I don't think my Australian friends say it either, but I never really noticed. Here's to differences, I say! Huzzah! To "wish" someone, is to greet someone, in India.Its perfectly acceptable in India.